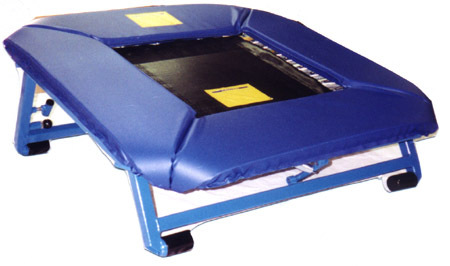 The TrampMaster Mini-Trampoline has 37" x 37" tubular steel frame with a 20" x 20" double-thick black polypropylene bed. The bed is attached with 32 chrome plated 6" tapered-end springs. High density 1" foam padding completely covers both the frame and the springs. The padding is secured to the frame by steel springs in four places to help prevent inadvertent tearing or movement. The angle of the frame is easily adjusted on the high side of the unit from 9" to 16". Double braces on the high side give added strength where needed most. The unit folds flat for easy storage and inexpensive UPS shipping. Shipped completely assembled and ready for immediate use. 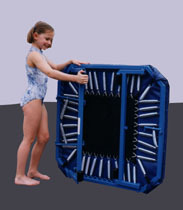 Legs have protective rubber feet for floor protection and for slippage resistance (Shipping weight 60 lbs). 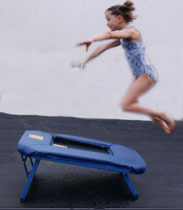 Be sure to check out all the color options we offer for our mini tramps and replacement pads.